By regional author Katie Moose. What could be more enticing on a hot summer's day than to sit down to a table covered with newspapers, fresh steam crabs, Old Bay Seasoning, cole slaw and a cold beer? Or is it something more elegant that you're looking for—Beef Chez Conduit (beef tenderloin with Bearnaise sauce), fresh asparagus, new red potatoes, and pumpkin cheesecake. Getting hungry? Take a peak inside and you'll discover region rich in culinary delights and history. Every year I visit my favorite shore towns along the Upper East Coast and try to discover new ways to celebrate summer. But then comes September and all of a sudden "real life" returns. Oh, how I wish the flavor of summer could remain. That's why I asked the chefs at my favorite seaside haunts if they would share their secret summer recipes. The result is Coastal Cuisine, a compilation of over 100 recipes from 65 seaside restaurants, hotels, and inns. I hope that as you make these dishes, they bring you back to a sunny, warm spot in your mind. After all, the memory of a great meal is the ultimate souvenir. by the Junior League of Baltimore. "This cookbook is filled with wonderful recipes you will make again and again for company. The chapters include Beverages, Appetizers, Eggs, Pasta & Cheeses, Soups & Sandwiches, Fish & Shellfish, Poultry & Game, Meats, Vegetables & Side Dishes, Breads, Salads, Sauces & Spreads, Desserts, Pies & Pastries, Cakes, Cookies & Candy, Pickles & Relishes, Celebrities, Restaurants, Caterers & Vineyards, Ethnic Festivals, Menus and This & That. Be sure to try the Crab Cakes on pg. 84 and the Chicken and Crescent Almondine on pg 114. You won't be disappointed!" By the State of Maryland Dept of Agriculture. This is the first of three seafood cookbooks published for the Maryland Office of Seafood Marketing which furnished all recipes. It is considered one of the best seafood cookbooks for cooking traditional crab, oyster and fish the "Chesapeake Way." This is the second of three seafood cookbooks published for the Maryland Office of Seafood Marketing which furnished all recipes. 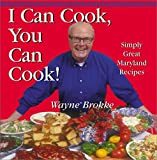 It is considered one of the best seafood cookbooks for cooking traditional crab, oyster and fish the "Chesapeake Way."